Please note that the content of this book primarily consists of articles available from Wikipedia or other free sources online. 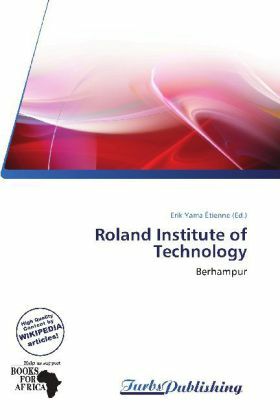 Roland Institute Of Technology, Surya Vihar, Berhampur, Orissa, India, is also known as RIT and was established in the year 2000, to impart degree courses in engineering under the Roland Educational & Charitable Trust. The prime objective of the Trust has been the promotion of facilities of technical education for people of South Orissa and around. It is ISO 9001:2000 certification and affiliated to Biju Patnaik University of Technology(BPUT).The trust envisage to develop a center of Education Excellence in and around Berhampur comparable to the best in the country in short span of time. We strive that our students not only provide technical manpower to our industries, but also by their innovative skills, open vistas of new technologies, which may augment avenues of employment for others.